While grapes are being picked and crushed across Australia, the AWRI’s researchers are also enjoying their busiest time of the year. Vintage trials form a key part of AWRI research, as the opportunity to put theory into practice and set up the experiments that will be monitored and tasted during the rest of the year. Thanks are extended to the many industry contributors working alongside the AWRI to conduct these trials who generously provide access to experimental vineyard sites, grapes, wines and other facilities. This year vintage trials are happening across a diverse range of areas. AWRI bioscience researchers are trialling the latest hybrid yeasts, yeast strains that produce high levels of ‘rose’ aroma compounds and new strains of malolactic bacteria. In the area of process improvement, trials are investigating effects of oxygen in red ferments and the impact of juice pasteurisation. Other researchers are assessing the effects of vineyard nutrient sprays and sun exposure on grape composition and wine flavour, mapping grape aroma compounds in cool climate Shiraz, investigating the flavour and mouth-feel consequences of whole bunch ferments, and evaluating management strategies for processing smoke-tainted grapes. Results from these projects and others will be published as they become available; however, if you’d like to know more about any of this work, please contact the AWRI (Ella.Robinson@awri.com.au or 08 8 313 6600). 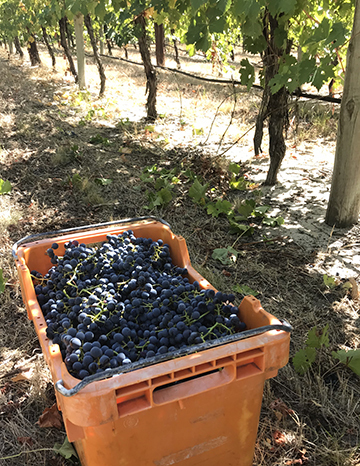 The first fruit has been harvested for the AWRI’s 2018 Cabernet Sauvignon winemaking trial, in which eighteen 150 kg ferments will be conducted, with a single winemaking variable being changed in each one. This trial follows on from two successful previous vintage trials with Pinot Noir and Shiraz, the wines from which have been presented in tastings across Australia. 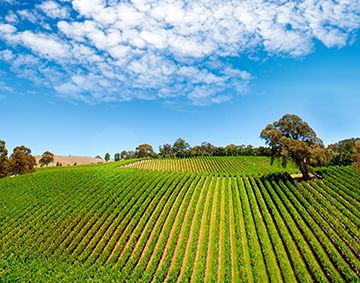 The treatments in the current trial were chosen in consultation with some of Australia’s leading Cabernet Sauvignon producers, and where possible, they have been tailored to complement previous and current AWRI research projects. The aims of the trial are to illustrate the sensory effects of applying specific techniques during winemaking, and to provide advice on the practical application of those techniques in a commercial setting. The wines made during the 2018 trial will be presented to industry in tasting workshops in 2019. A new arrival in the AWRI research labs is automating the isolation of yeast and bacterial colonies collected from ferment samples. The Singer Instruments PIXL microbial colony picker can separate hundreds of individual microbial colonies from an agar plate and place them onto a fresh plate for further analysis, at up to 1,536 colonies per plate. This instrument is critical for AWRI research, including the metagenomics project that is isolating thousands of microbes from wild ferments across the country. Previously such projects called for each colony to be manually collected from agar using the tip of a sterile toothpick, a labour-intensive process that limited the scope of what could be achieved. 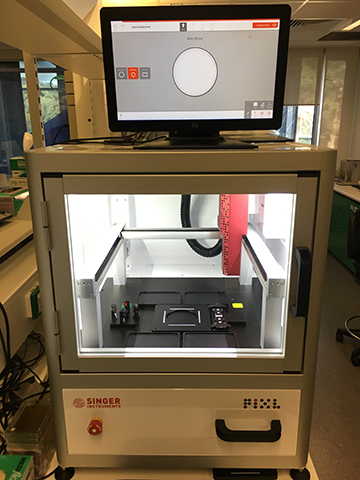 The PIXL is the latest design of colony picker from yeast handling specialists Singer Instruments and is the first of its type to be installed in a lab anywhere in the world! Two new fact sheets have recently been added to the AWRI website. The first, Objective measures of grape quality, summarises results of a project that investigated predicting grape grade based on chemical or spectral analyses. The second focuses on achieving successful malolactic fermentation in white and sparkling wines. This includes tips for managing challenging ferment conditions and choosing the best strain for the job. The AWRI fact sheets collection contains more than 100 fact sheets covering topics across oenology, viticulture, environment and wine and health. AWRI Commercial Services is now using a discrete analyser instrument for routine free and total sulfur dioxide analysis. This new instrument replaces an ageing flow injection analysis instrument and can process more than 100 samples each day, with very limited staff input. The same instrument can also be used to analyse other wine components such as glucose, fructose, malic acid and volatile acidity (as acetic acid). However, the team won’t be getting rid of the sulfur stills any time soon – the Rankine/Pocock aeration/oxidation method is still the reference method for SO2 analysis. More information about the new method and how it was developed is available in a recent article published in AWRI Technical Review. 1987 Pereira-Caro, G., Ordóñez, J.L., Ludwig, I., Gaillet, S., Mena, P., Del Rio, D., Rouanet, J-M., Bindon, K.A., Moreno-Rojas, J.M., Crozier, A. Development and validation of an UHPLC-HRMS protocol for the analysis of flavan-3-ol metabolites and catabolites in urine, plasma and feces of rats fed a red wine proanthocyanidin extract. Food Chem. 252: 49-60; 2018. 1988 Schelezki, O.J., Smith, P.A., Hranilovic, A., Bindon, K.A., Jeffery, D.W. Comparison of consecutive harvests versus blending treatments to produce lower alcohol wines from Cabernet Sauvignon grapes: impact on polysaccharide and tannin content and composition. Food Chem. 244: 50-59; 2018. 1989 Stockley, C. Ask the AWRI: wine instabilities – the solids won’t hurt you. Aust. N.Z. Grapegrower Winemaker (649): p. 66; 2018. 1990 Wilkes, E. [Is it the fault of the closure or the wine?] È colpa del tappo o del vino? OICCE Times 73 (18): 15-18; 2017. 1991 Gawel, R., Schulkin, A., Smith, P., Kassara, S., Francis, L., Herderich, M., Johnson, D. Influence of wine polysaccharides on white and red wine mouthfeel. Wine Vitic. J. 33 (1): 34-37; 2018. 1992 Dry, P. Dolcetto. Wine Vitic. J. 33 (1): p. 56; 2017.